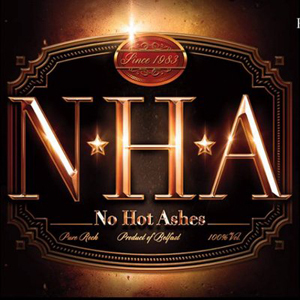 NO HOT ASHES dropped their self-titled debut album back in March, and much like with any album, there are songs that are great, and there are songs that are just kind of…there. The band originally formed in 1983 and released a single in 1986, entitled “She Drives Me Crazy”. They’d originally signed to GWR Records in 1988, and then proceeded to relocate and complete an album, all in the same year. Delay after delay in getting the record released, and the band eventually deciding to split up by 1990 resulted in the album being put on the back burner… indefinitely. Twenty-three years later, the guys decided to put the band back together for a one-off tribute show that ended up proving more lucrative than was originally thought. In the past five years, NO HOT ASHES have garnered more and more fans who are simply hooked on their musical stylings and of course, since they didn’t release a debut album until thirty-five years after their original inception. The above-mentioned self-titled album was long anticipated. Unfortunately, the album release has been somewhat bittersweet, as one of the founding members, bassist Paul Boyd, lost his battle with cancer in 2017. Boyd did play on the album however, and NO HOT ASHES have dedicated the release to his memory. Straight out of the gates, “Come Alive” is damn good. Very catchy, and I’ve found myself listening to it repeatedly. I think it is a great song to open the album, and a good way to bring in new fans who may have never actually heard of them before...like me. Hell, they were together and broken up three years before I was even born. “Good to Look Back” comes in hot as well, but it pretty well loses me right in the middle. In all honesty, I could hardly sit through the entire song. Unfortunately, I can’t write a cohesive review if I don’t listen to every song start to finish, multiple times. So here we are. “Satisfied” is just not as satisfying as I may have hoped. I enjoyed the guitar solo, but that was about it. “Boulders” was a nice change of pace. It really showcases that these guys are capable of going hard, but also slowing it down a bit without compromising their end goal of putting out a banger of an album. “I’m Back” brings back the heavier sound (ha! See what I did there??) but it really sounds like a lot of the other songs on this album, so it wasn’t easy to get into, especially immediately following “Boulders” which exhibits their ability to sound different. Good song, but disappointing when you realize it sounds so much like some of the other songs on the album. Beginning the second half of the album, we are presented with “Glow” which is decent but doesn’t appear to me to be anything to rave about or listen to on repeat for hours. Aside from the guitar solo, nothing truly stood out to me about this track. The more I listen to it, the more it starts to grow on me, but even with that, I can honestly say that I’ve skipped over this song more times than I’ve listened to it. That doesn’t necessarily bode well or give me hope that I’ll be fawning over it in the future. “Over Again” is much of the same — All bark and no bite. “Jonny Redhead” gives me much hope, and it isn’t just because I am a redhead myself. I just truly enjoy it, and I’ve found myself dancing to it more than once. “Souls” is another song I thoroughly enjoy, and it makes me feel things, which is hard to do, as my soul is as black as the coffee I drink. I could listen to this song multiple times a day, every day, and never get bored of it. As far as I am concerned, this is the shining star of the album. Finally, we come to “Running Red Lights” which, as it is the last track on the album, could use to be a stronger song. It is still good, don’t get me wrong, but a different song could’ve been better utilized in its place. This is a decent debut album, especially after all they’ve gone through to get to the point of releasing it. Things could be better, things could be worse, but after thirty-five years of ups and downs, being together and being broken up and members dying, I think it’s the best that could be expected of them. Music has changed, to an extent, in that time, and maybe that is where some of my discrepancy lies, but even so, I think it is a great debut. Definitely an album to keep in the back of your mind if you’re looking for new music. Congrats, guys, on finally making it to this point.